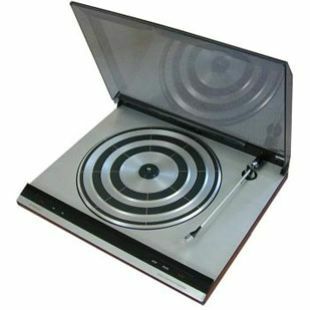 Beogram 6000 - Type 5751 - was a fully automatic record player with one-touch operation. Put a record on the turntable, touch START and let Bang & Olufsen technology do the rest. The lightweight, low inertia tone arm was fitted with the MMC 20EN pick-up cartridge. This had a naked elliptical diamond and a low Effective Tip Mass which, together with the lightweight arm, secured excellent tracking performance and minimum record wear. The patented spring suspension system effectively prevented external knocks and vibration from affecting tracking and sound quality. This later radial 6000 model was fitted with Datalink and was really a Beogram 2402 with new electronics in the same design. It really did not match the Beomaster 6000 and was a short lived and frankly unpopular model but was offered as a cheaper alternative to the tangential tracking and tangential drive Beogram 6006. These decks were both replaced by the Beogram 6002. This deck had the newer MMC3 cartridge and was a strange amalgam of the two earlier decks in that it had a simplified tangential arm but belt drive for the platter.